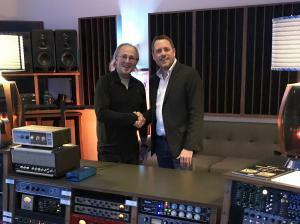 NASHVILLE, TN, UNITED STATES , January 11, 2019 /EINPresswire.com/ -- Argosy Console, Inc. (ARGOSY) is excited to announce its acquisition of all assets of Sound Construction and Supply, Inc., a Nashville based manufacturer of furniture for recording studios. This acquisition will help to enhance and expand Argosy’s portfolio and further allow it to deliver on its mission to help studio owners transform their space. “When I first toyed with the idea of selling SCS, I knew it couldn’t just go to someone that wanted a hobby, but could take it to the next level. I looked around the industry and there was only one phone call to make. ARGOSY’s commitment to ‘made in America', along with their sterling industry reputation for customer service made this an easy choice. I am excited to see the potential for this new venture,” said Todd Beeten.